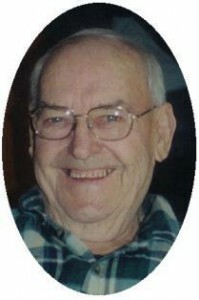 Francis P. Schmitz, “Cisco”, 85, of 409 Allen Street, Random Lake, WI died surrounded by his family at St. Nicholas Hospital, Sheboygan on Sunday, May 3, 2009. He was born on March 2, 1924, in the town of Fredonia, a son of Frank and Catherine Schommer Schmitz. He graduated from St. Nicholas School in Dacada. He enlisted in the United States Army on December 29, 1948 and was sent to serve in the Korean War in July, 1950 in the 82nd battalion. He was discharged on December 28, 1951. He received the Purple Heart for his service and was a lifetime member of the Ozaukee County Memorial Post 5373 Veterans of Foreign Wars. On July 12, 1952 he married Norma A. Tackes of Belgium at St. Nicholas Catholic Church in Dacada. From 1953 until his retirement in 1986, he operated Schmitz Construction of Random Lake providing masonry labor. His favorite times were spending time with his family, hunting, fishing, doing woodworking such as building bird houses, ‘Aggravation’ game boards and replicas of meaningful homes. He also enjoyed gardening and other yard work, challenging family members at his favorite game-‘Aggravation’ and watching sporting events or a good Western on TV. He is survived by his wife Norma and their dog Katie, 4 sons and 2 daughters; C.J. of Milwaukee; Frank (Terri) Schmitz of White Bird, Idaho; Ann (Dan) Wilson of Slinger; Jeffrey (Tammy) Schmitz of Random Lake, LaVonne (Ron) Ellenbecker of Slinger, Timothy (Karen) of Random Lake; 14 grandchildren: Angela, Sara, Melissa, Kurt, Eric, Mark, Dustin, Jeremy, Kyle, Amanda, Jessica, Michael, Nathan and Tyler and 6 great-grandchildren (and one soon to arrive). He is also survived by 1 brother and 4 sisters: John (Mary) Schmitz, Clara (Elmer) Wellenstein, Helen Thomas, Evelyn Walber and Grace Lanser, all of Belgium; sisters-in-law Marcella Schmitz of Random Lake; Angela Schmitz, Monica Schmitz, Mary Schmitz and Patricia (Bill) Burris, all of Belgium; nieces, nephews, other relatives and friends. He is preceded in death by his son Michael, brothers Emil, Irwin, Nicholas, Alex, Arnold, Art, Cyril and Gilbert Schmitz; brothers-in-law Clarence Weyker, Archie Thomas, Joseph Walber and George Lanser and sisters-in-law Genevieve Schmitz and Sylvia Schmitz. A Mass of Christian Burial will be celebrated at 2PM Saturday, May 9, 2009 at Our Lady of the Lake Parish-St. Mary Chapel 300 Butler Street, Random Lake. The Reverend James Ernster will be the celebrant. Interment will take place at St. Nicholas Catholic Cemetery, Dacada with military honors. Visitation will be from 11AM-2PM Saturday AT CHURCH. The family requests memorials to them or the charity of choice appreciated.